2nd February is celebrated as World Wetlands Day around the world. It is this date on which an International Convention for the protection of wetlands was signed at the Iranian city of Ramsar. In India, the Ramsar Convention has identified 27 wetlands of international importance and they are being rigorously monitored. However, there are thousands of wetlands around the country which are being rapidly degraded, and whom depends the lives of many more thousand people. 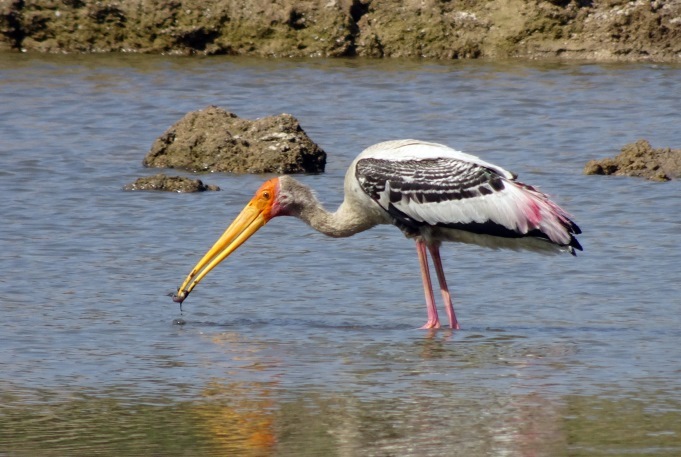 Delhi itself has lost hundreds of wetlands in the recent past. This is a dangerous situation for the city. Anybody who works with Nature understands well the importance of wetlands. There is also need to raise awareness about these wetlands with the general public as well as with the bureaucrats and politicians. This requires the citizens to first become aware of the wetlands around them, and then visit them regularly. And for that, they need to first understand what is a wetland, and why is it required to be conserved? 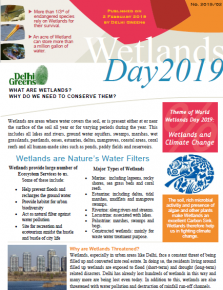 Ahead of Wetlands Day 2019, Delhi Greens has released an Info-Brochure generating awareness about the role of wetlands in our lives. Delhi Greens has also been working to create an online, interactive inventory of all the wetlands found in Delhi. Based on a similar study for North Delhi in 2014, the disappearance of many wetlands is already being noted. This is alarming especially since wetlands are the reason for the only good thing left about winters in Delhi, migratory birds. As per this Info-Brochure, wetlands help in recharging ground water and filling up of ground water aquifer. This is important for Delhi because water table has been steadily declining in the city. Wetlands also help prevent flood and provide habitat for the urban biodiversity found in the city. Thus, it becomes the responsibility of all citizens of Delhi to become aware of the wetlands around you, report any illegal activity taking place around the wetlands and grow native trees and help maintain the cleanliness of the wetlands, as per the Info-Brochure. The theme of World Wetlands Day 2019 is Wetlands and Climate Change. Thus, cities like Delhi can also help reduce their carbon footprints by protecting and promoting the conservation of wetlands. Here’s hoping Delhi will see the maintenance of all the blue dots on its map!